My Christmas baking experience is getting exciting and I love the aroma that fills my home during my baking sessions. My current obsession is shortbread and my most favorite to date are fruit and nut shortbread cookies. The most easy cookies to make – just slice and bake. The good thing about this shortbread recipe is its versatility where you can play around with different flavors and add ons like dried fruits, nuts, zest or espresso. 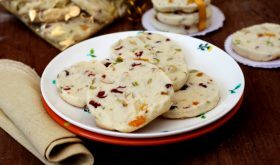 The addition of dried fruits like raisins, dried cranberries and nuts like pistachio or almonds accentuate the classic shortbread flavor and take it to a whole new level. And do you know the best part of this shortbread recipe? It is eggless and you can freeze the unbaked log of shortbread dough and bake in a jiffy when friends drop by. 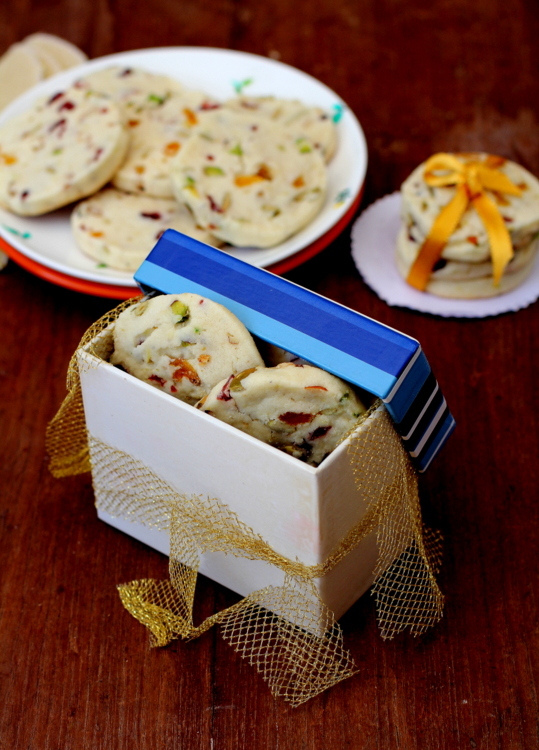 The fruit and nut shortbread cookies are light, delicate and buttery with a slight crunch. The shortbread has the right amount of sweetness, subtly spiced with cardamom and a fragrant zing of lemon-y zest. 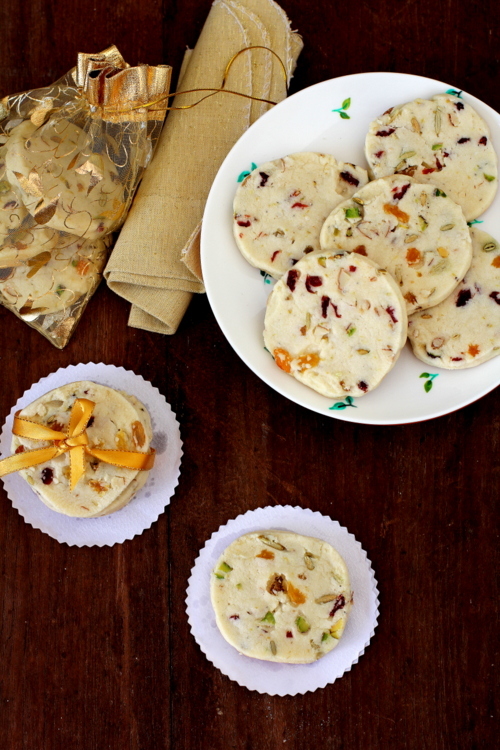 They make for a perfect accompaniment with a cup of tea or coffee or just serve them as a dessert. I highly recommend you bake this classic holiday eggless cookie to gift your family and friends this Christmas. In a bowl, add the softened butter, powdered sugar and salt and beat till light and fluffy. Add vanilla extract, cardamom powder and lemon zest and mix well. Add the flour and cornflour and mix to make a soft dough. 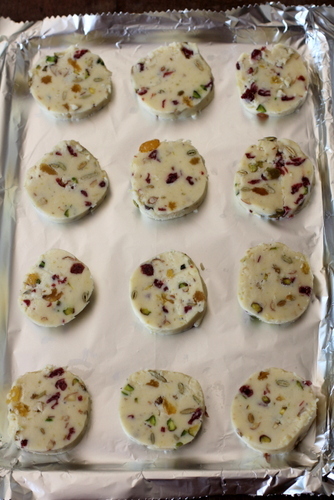 Add the finely chopped dried fruits and nuts and mix well. Place a 15" by 15" square plastic wrap on the work surface. 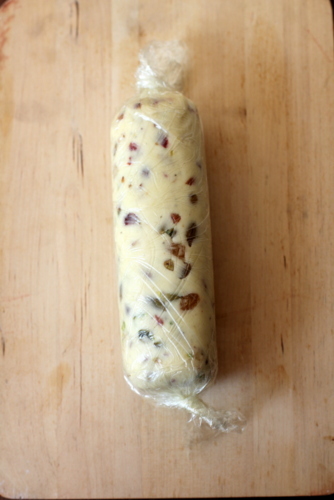 Place the soft dough on it and shape it into a log as shown in the image above. Wrap the log with plastic wrap and seal the ends. Again wrap it in aluminum foil and freeze for an hour or until it hardens. At the time of baking, pre heat oven to 160 C and remove the dough from the freezer. Unwrap and slice the dough into 1/4" slices and place them on a parchment paper or aluminum foil lined baking sheet. Place them at least an inch apart as they expand on baking. Place baking sheet in the middle rack of the oven and bake for 13-15 mts or until lightly browned around the edges. Remove from the oven and cool on a wire rack. You can add any dried fruits and nuts of your choice. The shortbread will be soft on touch after baking and will harden once it is out of the oven and cools down. Check from 12 mts onwards as the temperature differs from oven to oven. Sometimes it could take upto 17 to 20 mts to bake. So very festive. Love shortbread! Can powdered sugar be replaced with sugar granules?? ???? The outer yellow skin of the lemon is zest. Grate it and see that the white part of the skin is not grated. Sailu garu, I liked new look of your blog. 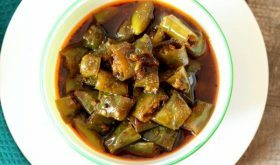 I tried so many recipes of yours, loved them. thanks for posting such a nice eggless recipe. Hi sailu! I’m a new follower of ur food blog n new to baking too. Can u plz guide at what temperature n for how long we need to preheat OTG for cookies n cakes? You can pre-heat the oven at 180 C for 15 to 20 mts and bake at the mentioned temperature as called for in the recipe. These tasted divine! My husband and I were reminded of the biscuits we used to get in our hometown (similar to Karachi biscuits). Hi Sailu! Lovely recipe but was not able to cut them in rounds as they we breaking upon freezing. How did you make such perfect cuts? You have to be careful and allow it to slightly thaw but not completely soften as it might crumble fully. Hi….I made it today and it came out really well…but I need add around 3 tsp water as it dough was so crumbly…may I know the proportions in grams…it may help next time…and Thanks for recipe. ..ur site is also very nice. .. I just made these, they taste amazing, but cutting them in proper rounds was not possible, i had to reshape them after. Any suggestion on how to get the proper shape? ?